HURRY! - Only 3 left! One of magic’s best-loved performers . . . at his very best! For decades, Aldo Colombini’s name has been synonymous with powerful yet commercial magic. His brand of conjuring is always knock ‘em dead strong but his methodologies rely more on subtlety and cleverness rather than difficult sleight of hand. In this exciting series, you’ll see Aldo perform his favorite effects. Every item is something you’ll want to add to your repertoire immediately. It’s all commercial...it’s all great...it’s all Aldo! HAVE A NICE DAY - Sure to be one of the most talked about effects in this series, a card is signed and returned to the pack. Several cards are removed and the spectators are shown that the selected card is not among them. A smiley-face sticker is attached to the back of a card but soon, there are smiley-faces on the backs of all the cards! Just as suddenly, the smiley-faces disappear from all of the cards save one—the spectator’s signed selection. A great walk-around item! FOUR RED CARD TRICK - The classic Homing Card done with jumbo cards. A black card continuously reappears among four red cards and at the finish, the cards are shown to be all black - and then all red! BAREFOOT IN THE PARK - Three cards are selected in what seems to be a very strange game of Poker. Then, a spectator who never saw the original selections chooses three cards—they turn out to be the chosen cards! MINI-MAXI - A standard gag that produces two astonishing predictions. This is an effect that you’ll put right into your working repertoire! GET THE BALL ROLLING - Aldo’s version of the classic ball routine that’s performed entirely in the hands without the need for a table or handkerchief. It looks like difficult manipulation but you’ll be doing it in no time! RUBBER ILLUSION - A Queen stretches to twice its length and then—if you blink, you’ll miss it!—it visibly changes into a miniature card. You’ll fool yourself with this transformation! PACKED BAGS - A card is freely selected and even though the spectator shuffled the deck beforehand, the selection is seen to match the performer’s prediction. THROW IN THE SPONGE - Just when you thought all of the entertainment potential had been wrung out of sponge balls, Aldo will delight you with his routine, full of comedy and audience participation. THAT’S AMORE - The performer and spectator become two Cupids as they magically pair the Kings and Queens and, appropriately, a message of love appears on the backs of the cards. ANOTHER’S BET - Two coins travel between the performer’s hands and even back and forth from his pocket until, as a finale, a jumbo coin appears. A great coin routine for close-up and stand-up performances. PERPETUAL CALENDAR - A spectator shuffles a pack of cards and uses them to determine a specific day. A pocket calendar with playing cards printed next to every day is introduced and the spectator is asked to look up the card next to their day. The card matches the prediction! 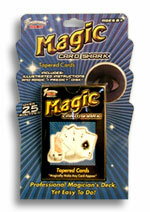 ULTI-MATE-M - Jumbo playing cards, cut into quarters, are introduced and four spectators each select a random quarter. When the pieces are assembled, it’s found that three match but one is part of a completely different card. Not to worry, however, as the performer’s prediction matches exactly—including the mismatched piece! HEART TO HEART - A Two of Hearts is shown and the performer apparently plucks off the pips, producing two sponge hearts and leaving behind a totally blank-faced card! After some magical by-play with the hearts, the performer miraculously merges them into one jumbo heart! This is a routine guaranteed to warm the real hearts of your audience! I always get fast, friendly service when dealing with MJM Magic. I continue to buy from them because of the great service. Thanks so much.